The Executive Director of Orlean Invest, a major concessionaire in ports in Nigeria through one of its holding companies, Intels Nigeria Limited, Mr Damir Miskovic has been appointed the Honourable Consul of Croatia in Nigeria. Miskovic said today in Abuja that he had already presented his letter to the Nigeria's Minister of Foreign Affairs, Mr Geoffery Onyema, in an event witnessed by Directors of Missions of European Countries in Nigeria on Feb. 11, 2016. Miskovic said he had been in Nigeria for 25 years and that he had been a Nigerian citizen for two years. He said that his Group, which employs over 25,000 Nigerians from different parts of the country had developed the biggest free zone in Nigeria that is dedicated to support activities in the oil and gas industry. He also said that the Group’s free zone which is located in Onne, Rivers State is the company’s biggest base in Nigeria. He said: ``We are proud to say that apart from investments we have already made, as well as various port infrastructure and facilities we have developed, we are also involved in some major future projects in Nigeria. 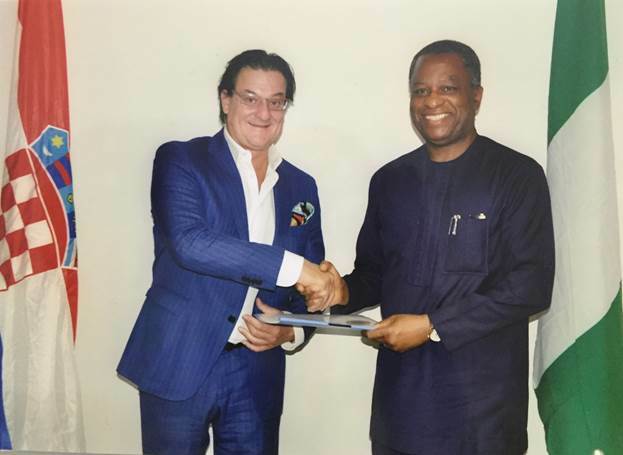 ``We are a major investor in the Eko Atlantic City development, also known as Nigeria International Commerce City, pioneered by the Chagoury family and supported by the Lagos state government. "Our group is also involved in the development of mega port in Badagry together with Maersk, MSC and others," he said. On his new assignment, Miskovic said: ``My mission is to make the two countries even closer, leveraging on the cordial diplomatic relationship which has already been established. ``My desire is to open Embassy of Nigeria in Croatia as well as open a Croatian Embassy in Nigeria. "I wish diplomatic relationship contributes in developing business activities and benefits firstly for the people of the two countries and for the two economies. ``I have had several meetings with major companies in Croatia and I have presented to them the huge and gainful opportunities in the Nigerian market, after which most of them visited the country while some are considering to invest, while one has set up businesses in Nigeria and is operating," he said. Miskovic said he had met with the President of Crotia, Kolinda Grabar-Kitarović and that she said the major task was for him to bring the two countries closer. In his speech at the ceremony of presenting his letter, the Foreign Affairs Minister, Mr Geoffery Onyema told Miskovic that ``I think you are pretty unique as Croatian living in Nigeria for 25 years. It is actually fantastic." The Minister commended Miskovic for the work he had been doing in Nigeria, which has contributed greatly to the growth of the Nigerian economy, together with the impressive program under the corporate social responsibility activities of his organisation. ``Clearly, you will be an asset for Croatia as well as for Nigeria. We are here to be of any assistance if required to support you in enhancing the process of cooperation with Croatia,’’ Onyema said. Onyema observed that the plan to establish an Embassy of Croatia in Nigeria would open up opportunities for both countries. ``I have no doubt that you will excel in this position. I can already see the passion with which you speak; your passion for Nigeria, your passion for Croatia, your excellent connections and contacts as well as being engaged in major projects in Nigeria. ``I think you are very much of a man to be considered an asset to Nigeria,’’ Onyema said.